By the sixth century BC, the Vedic tribes (the Janapadas, from 'Jana', 'people' or 'tribe', and 'pada', or 'foot') had subdivided into sixteen great Mahajanapadas ('maha' means 'great'). These were Magadha (southern Bihar), Kashi (Varanasi in Uttar Pradesh), Kosala (Awadh in Uttar Pradesh), Anga (Eastern India), Vriji (northern Bihar), Malla (north-central India), Panchala (Budaun, Farukabad, Uttar Pradesh), Matsya (Jaipur, Alwar, and Bharatpur in Rajasthan), Surasena (Mathura in Utar Pradesh), Ashmaka (south of the Vindhya Mountains, in Maharashtra), Avanti (Madhya Pradesh), Gandhara (Kandahar in Afghanistan), and Kamboja (the Hindu Kush region in Afghanistan). Eventually four major kingdoms became the most powerful. These were Kosala, Kashi, Magadha and the Vriji confederacy. 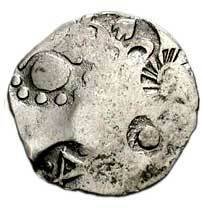 In the first half of the first millennium BC, Magadha was ruled by King Bimbisara of the Haryanaka dynasty. He was murdered by his own son, Ajatshatru, who then ascended the throne. Ajatashatru subdued Kosala, Kashi and Vriji and became the undisputed king of northern India. As destiny would have it, Ajatashatru was also killed by his own son for the Magadha throne. This history of parricide was repeated amongst successive kings (Udayabhadra, Anirudha, Munda, and Nagadasaka) until the dynasty was overthrown amidst a popular rebellion, after which their minister, Shishunaga, became king. However, Shishunaga was murdered (as per R Thapar) by a usurper (although some say that the murder victim was his son, Kalasoka, including L Prasad. According to other sources there were at least five kings ruling after him - the sons of Kalasoka: Nandivardhan, Kshemadharman, Kshemajit, Bimbisara II, and Mahanandin). The usurper's name was Mahapadma Nanda, a shudra by birth who founded the Nanda dynasty. Under the Nandas, Magadha emerged as a very powerful empire. Most of the surrounding kingdoms either merged into Magadha or ended up as its vassals. This position with Magadha being totally dominant remained the case for centuries to come. There were said to be eight kings (Pandhuka, Panghupati, Bhutapala, Rashtrapala, Govishankara, Dashasidhkhaka, Kaivarta, and Dhanananda) who followed after Mahapadma Nanda. Later the region of Afghanistan came under the Achaemenid rule of Cyrus, the king of Persia. In 326 BC, after defeating the Achaemenid King Darius, the joint armies of Macedonia and Greece marched under Alexander the Great into the Indian subcontinent, acquiring one small kingdom after another. 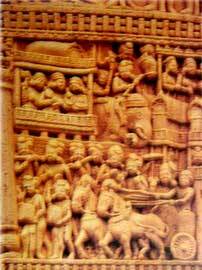 Alexander's most famous battle, at Hydapses against King Puru (Porus) of the Jhelum region, is vividly documented. Following Alexander's return to Persia, his satraps were unable to retain control over India. An upstart called Chandragupta Maurya (according to some sources the son of Mahanandin of the Shishunaga dynasty) had succeeded in overthrowing Dhananada, the last Nanda king of Magadha. Chandragupta Maurya soon pushed back the Greeks beyond present day Afghanistan. Chandragupta Mauryan and his descendents were destined to become the rulers of a large empire whose boundaries began in Afghanistan and ended up in Karnataka in southern India. Despite occasional gaps and inconsistencies, India's recorded history had begun with the founding of an empire. The army of Alexander was referred to as the Yavanas, probably because of their homeland in the region of Ionia.